The fax machine was invented in 1964 by Xerox and despite all of the leaps in technology, it is still found in offices all across the world. However, as businesses migrate to Unified Communications using Internet based technologies such as Voice over Internet Protocol (VoIP) this outdated piece of equipment has become problematic for these new technologies. As a VoIP information website, WhichVoIP.com receives a lot of questions each day from our visitors and the most asked question relates to Fax over IP (FoIP) service. It is the goal of this article to identify your options for low cost but reliable fax service, along with some of the pitfalls to look out for and ways to combat them. This article has a slight bias toward businesses but also applies to home users. Will my Fax Machine Work if I Switch to VoIP? You may be reading this article with the sole purpose of understanding if your fax machine will work if you move to a VoIP phone service. The short answer is MAYBE! I know, a little vague but we always try to be up-front with you at WhichVoIP.com. There are a lot of variables at play that will determine how successful your fax transmissions will be over VoIP and if you should look at other faxing methods. As you read this article consider the following question with respect to your faxing needs. Hopefully by the time you get to the end of the article you will have a clear direction forward. Are your faxes of a critical nature? Do you require real-time faxing capabilities? How many faxes do you send and receive each month? If you have moved to VoIP or are researching a provider, what type of faxing options does the provider offer? Do you want to remove the maintenance headaches of owning fax machines? Are you comfortable using PC software, scanners and email for faxing? In order to help our understanding of the issues with Fax over Internet based technologies such as VoIP it is often helpful to look at the underlying technology. Fax machines scan paper as it is fed through the machine, and is often specified by how many scan lines per inch that the machine is capable of scanning, for example 400 vertical scan lines per inch. Think of this in a manner similar to a TV where the picture is made up of thousands of small pixels. The fax machine scans each tiny line on a piece of paper using technology similar to the CCD (Charge Coupled Device) image sensor that is used in a digital camera. This produces a series of black and white dots (or pixels if that helps your understanding) that would look like a tiny bar code to us. This information is gathered together such that it looks like a digital image of the paper that has just been scanned. However, this is a lot of data and if you think back to the days of telephone modems, we were limited in terms of the phone line transmission speed. For this reason, the scanned images are compressed using techniques such as Modified Huffman and Modified Read. This reduces the amount of data to be transferred and therefore the time to transmit the fax image. The actual data is sent as tones that are modulated by a modem over a telephone line running at up to 14,400 bits per second. The tones are different frequencies and it is the change in frequency that is used to send a logical '1' or a '0' in digital terminology. You have likely heard the sounds that this makes when a fax is being sent or received on a phone line. If the phone line has a lot of electrical interference on it the modem speed is usually lowered automatically to reduce the amount of data errors in the transmission. At the receiving end, the fax machine receives the digital information from the analog modem (i.e. de-modulates the tones) and decompresses the data. It now has an image in its internal memory and prints this to paper based on the printer module inside the fax machine, for example using an inkjet or laser based printer. When it comes to faxing, a business or indeed a home user has essentially 3 options to consider, as detailed below. Landline/POTS Faxing: This is the form of faxing that we have been used to for many years. Your fax machine connects to an RJ-11 telephone socket in your home or business which then connects via copper wires to the Plain Old Telephone Service (POTS). A modem is used inside the fax machine to send the data over the analog phone line. The downside here is you are responsible for the maintenance of your fax machine and landline phone service is expensive. Outsource Locally: By this I mean going to a place such as a local Fedex store and using their fax machines for sending or receiving faxes. If you only need occasional access to a fax machine this is actually a very cost effective way to do this. You are not responsible for any of the fax machine maintenance or having to stock up on paper or ink. However the cost can get high if you need something more than occasional faxing. Faxing over IP (FoIP): This can be broken down into a number of smaller sub-categories, as discussed in the next main section. Essentially this is taking advantage of the Internet to send and receive faxes. This can be performed without a fax machine, using a scanner and a PC or an actual fax machine can be used too, by converting the fax data to packets and sending them across the Internet. For this reason it tends to be very cost effective if you have moderate or high volume fax use as you will not be charged for long distance calls. Of course, the assumption here is that you already have an Internet connection, otherwise this will add cost. Below you will find a comparison table for each of these fax methods. * FoIP can be performed in software with a PC/Tablet/Smartphone but also can use your own fax machine. ** Pricing based on the following approximate rates. 1-Landline at $40 per month for basic service and additional long distance charges. 2-Local Fedex rates at time of writing: $1.59 per page local and $2.49 for long distance. 3-Internet Fax service. This could be free with VoIP. For an efax service pricing is approximately $10 per month for up to 500 pages. The comparison chart above hopefully highlights the cost benefits of moving to a Fax over Internet Protocol (FoIP). The only potential negative aspect is reliability and this was deliberately stated as "Varies" in the table because it really depends on the underlying method used for faxing over the Internet. There are three main methods for sending faxes across the Internet: Fax Pass-through, Store and Forward and Fax Relay, and the merits of each will be discussed in the following sections. Fax pass-through is less common nowadays but many older VoIP ATAs (Analog Telephone Adapter) handled faxing via pass-through. Incidentally, an ATA is a box that converts your voice from an analog phone into a digital packet stream that is sent across the Internet and it is usually provided to you by a VoIP provider. A compression Codec is used inside the ATA to compress, and decompress, your audio so it takes up less Internet bandwidth but without noticeable degradation of the audio quality. For residential use, or a Small Office Home Office (SOHO) environment often the ATA has 2 phone line inputs. One can connect to a phone and the other to your fax machine ensuring that both lines can be in use at the same time. Businesses tend to use IP phones rather than analog phones which have the Codec functionality built-in so no ATA is necessary for phone calls but one would be needed for fax unless the business has an IP based fax machine. Pass-through is a real-time transportation method and the data from the analog fax machine (often designated as a G3 device and adhering to the T.30 ITU standard) is handled by the ATA in the same way that a VoIP call is handled. The problem with this is that the compression Codecs used for audio do not lend themselves well to the T.30 fax standard and the result is that the fax tones (i.e. the actual data) tends to get distorted. This can cause errors in the fax transmission and lead to poor reliability when it comes to faxing. However there are some things you can do to mitigate this problem. Change the Codec: Use a Codec such as G.711. This Codec does not compress the data as much as other Codecs so less distortion occurs on the fax tones. However you need to make sure that your provider can support G.711, nearly all providers do and in fact the G.711 Codec tends to be the default one used by service providers. The only downside here is that less compression means it is more bandwidth intensive so a decent Internet connection is required. Consult your ATA users manual to change Codec settings but of course make sure that your provider supports the Codec at their end. Added Redundancy: Some VoIP providers, such as Ooma, implement added redundancy to fax data so up to three times the amount of data is transferred. In other words any given data packet is sent three times. The advantage with this is that the added redundancy improves reliability since it can handle occasional packet loss, but at the expense of increased Internet bandwidth since three times the data is sent. Obviously to do this, both the ATA and the provider need to be in sync so call your provider about enabling this feature. Change the ATA: Upgrade your ATA to a newer model after talking to your provider to ensure you are getting one that is compatible with its service. Newer models may support fax relay T.38 standards (see below) which tends to have higher reliability. Consult the users manual for the ATA device in question in order to change the setting to T.38. Store and forward is a common method used by VoIP and eFax providers for handling faxes over the Internet. The ITU T.37 standard covers the store and forward protocol. In essence what actually happens for a regular T.30 based analog fax transmission is that the fax is sent over the PSTN to a local fax server (i.e. a local call). It is then converted into email format and sent across the Internet to a fax server that resides close to the destination where it is converted back to the T.30 protocol and sent to a fax machine via the PSTN as a local call. As you can see nearly all calls during this path are local calls rather than long distance. The Internet is used for the long distance transfers. Most online fax providers (often referred to as eFax or virtual fax providers) take this one stage further and actually remove the need for a fax machine at your business or home. All you need to do is add some software to your computer and drag and drop files to the application in order to send a fax over email. The eFax provider hosts fax servers in the cloud to perform the email to fax conversion. You may require a scanner to scan documents and signatures to get them into digital format to email to the fax servers. In the other direction, incoming faxes are handled by the fax servers and they match your fax number to an email address and send the fax to you as an email attachment, usually in the form of a TIFF or PDF document. Obviously a printer is required if you need to print out a received fax. Pricing tends to be very competitive and can be as low as $10 per month. Most eFax providers also offer apps for smart phones and tablets these days so you can send and receive faxes from anywhere. The only real downside with this method of faxing is that you lose the real-time aspect of the transmission so you do not receive immediate feedback as to whether the transmission was successful. This could be an issue for businesses that send and receive faxes of a critical nature. Reliability tends to be decent with this type of fax transmission since it is in digital form for most of the communication path. The Internet fax provider is responsible for handling all of the actual fax interfacing with the PSTN and they have state of the art fax servers to handle this. As always though, it depends on the fax machine they are interfacing with and more importantly which transport method is being used. TIP: Check your account for errors or set up email reminders so you know if an error has occurred with a fax transmission or reception. This is important because the fax is not sent or received in real time so immediate notification is not given. Our online Fax comparison and reviews section is a good place to learn more and compare some of the popular service providers. Also most of the VoIP providers you see on our site support this FoIP method, and it is often free as part of the phone plan or at a small additional monthly fee. See our provider summary table below for further details. 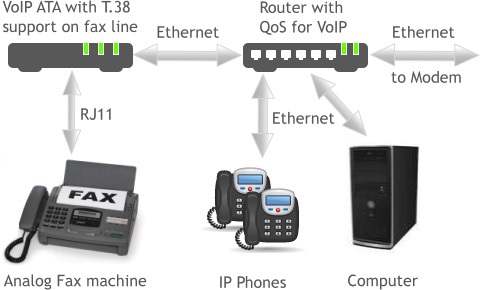 The T.38 ITU standard tends to be the de-facto standard for fax relay service and is supported by most VoIP service providers due to the inter-operability focus for this standard. This is a real-time method of faxing similar to the pass-through method but benefits from the fact that the fax data is not actually passed through a Codec. Instead the fax data tones are extracted from the fax message and sent using the T.38 fax relay protocol across the Internet. For this reason the data is not distorted and is sent in real-time unlike the store and forward method, so immediate notification is obtained regarding the success of the fax transmission. Another benefit of the T.38 standard is that it has robust redundancy built-in to the standard which helps ensure good reliability. If the IP network is impaired in any way then packet losses tend to occur on the data. For voice this may not be noticeable but for fax it can be devastating. Redundancy helps mitigate small packet loss errors. An advantage that T.38 has over pass-through redundant mode is that it uses less bandwidth for its redundancy. The only issue with T.38, and indeed the other FoIP methods, is that there are millions of old fax machines in the world and the timing specifications for faxing tend to be very loose. This is why faxing over IP can be great for some but others can have issues. Often it depends on the interpretation of the fax ITU standards and for a successful transmission, all devices in the path must adhere to those standards in the same manner. Most of the VoIP providers on our site support the T.38 standard these days which has helped remove many of the problems that have been observed over the years. However, for absolute critical faxing there is still nothing better than the landline, unfortunately. For those that have non-critical needs, in other words the majority of us, the adoption of the T.38 standard by most providers and the desire for low cost faxing has resulted in the growing popularity of T.38 fax relay transmissions across the Internet. A typical set-up for using a traditional G3 analog fax machine in a small business environment is shown below in Figure 1. The VoIP provider is responsible for routing the VoIP calls and faxes to their destination. This could be to another VoIP user or to the PSTN. Verify ATA Settings: Consult your ATA users manual to verify that your device is set to T.38 fax relay. Baud Rate: Reduce the baud rate for the fax machine as the data will be less prone to errors due to the relaxed timing. Error Correction Mode (ECM): Disable Error Correction Mode (ECM) for the fax machine. This helps improve fax relay calls when packet loss and jitter is experienced on the network. Use our VoIP test to test for packet loss and jitter on your network. T.38 Packet Redundancy: Consult your provider before enabling T.38 packet redundancy to make sure they can support this feature. Upgrade Fax Machines: Call your provider and ask if they have performed any compatibility tests with fax machines. It is likely that they have tested some of the mainstream fax machines on the market to ensure inter-operability with its service over T.38. Finally, let's take a look at some FoIP providers, the market they address and which standards they support. T.38 ATA $14.99/mo Unlimited faxes via PC software. T.38 ATA $39.99/mo for unlimited fax via dedicated T.38 ATA. Also supports faxes via PC software. T.38 ATA Incoming fax to email included. From $5.99/mo. Fax machines are still alive and well, to the surprise of many since this technology is approaching 50 years of age. Phone calls have already moved over to Internet based technologies such as VoIP and fax has followed suit. This has provided tremendous cost savings to those that still need fax capabilities but it has come at a slight cost, that being reliability. However, added functionality such as redundancy and the use of real-time fax standards have greatly improved reliability for faxing over IP networks. Store and forward faxing through cloud based fax and VoIP providers have become very popular amongst the masses as it removes any need to own and maintain your own fax machines and in the case of VoIP providers this service is often free with a phone plan. For all but those with mission critical faxing needs, Fax over IP appears to be the answer. For mission critical faxing stick with a PSTN landline dedicated to your fax machines. You can still take advantage of VoIP to save on your phone bills. Feel free to leave us a comment below if you have something to add or need certain points expanded. RE: Fax performance/settings using Vonage. For reliable fax operation with Vonage, their Tech Support insists that baud rate be set to 9,600 (slowest rate) and Error Correction Mode must be Off. Faxing one to three pages seems 90% reliable; however, four pages and more the reliability of a successful fax transmission decreases substantially to down to 0%.